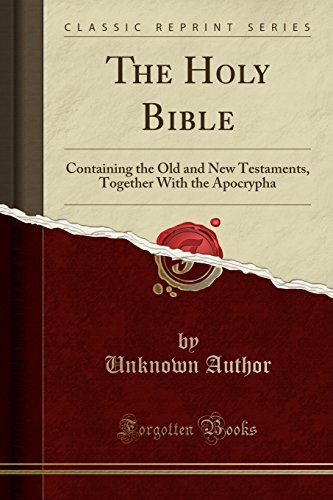 Excerpt from The Holy Bible: Containing the Old and New Testaments, Together With the Apocrypha<br /><br />Perceiving that the different European copies Of the Bible, even those printed at the Universities of Cx ford, Cambridge, and Edinburgh, Often varied, and sometimes in the use of important words, the Publisher deemed it an object of the first magnitude to ascertain, if possible, which text. Was the most correct.<br /><br />About the Publisher<br /><br />Forgotten Books publishes hundreds of thousands of rare and classic books. Find more at www.forgottenbooks.com<br /><br />This book is a reproduction of an important historical work. Forgotten Books uses state-of-the-art technology to digitally reconstruct the work, preserving the original format whilst repairing imperfections present in the aged copy. In rare cases, an imperfection in the original, such as a blemish or missing page, may be replicated in our edition. We do, however, repair the vast majority of imperfections successfully; any imperfections that remain are intentionally left to preserve the state of such historical works.